What direction is the angle on the middle ring? 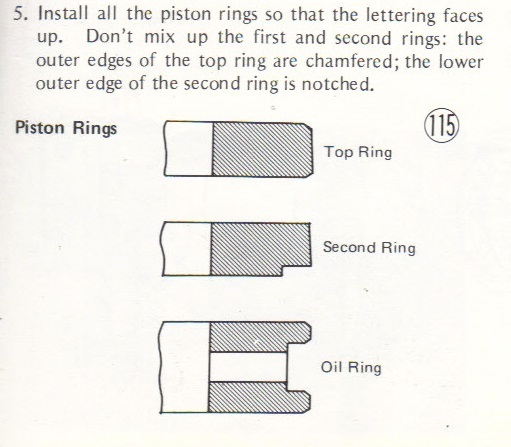 Sometimes the upper and lower ring (or upper and lower lip) on an oil ring is an angle similar to the middle ring in the pic. that I have mine backwards. either the taper is so small that I cannot discern it, or the ring isn't tapered, which concerns me a little - but both rings have the "r" so I'll just face that up"
The taper is too small to see. That looks better. You have fitted all the circlips? Yes, dont make me tear the engine apart again!!! Lots of progress made tonight. Still a ways to go, wiring, startup, tuning, timing, exhaust. But I am very excited about where I'm at now. Also, a look at the micro tacho that's mounted under the tank.